VietNamNet Bridge - Breeding shrimp in glass houses not only improves productivity, but also helps minimize pollution. Amid thousands of hectares of shrimp ponds in coastal areas, glass houses look like big girdle cakes glittering under the sun. Pumps inside provide oxygen. Farmers usually take a high risk if they decide to farm shrimp. If shrimp dies of disease, their efforts will be in vain. By early September 2016, farmers in Can Giuoc district of Long An province had farmed 1,200 hectares of shrimp ponds in the second crop of the year. However, the shrimp in 225 hectares of ponds caught disease. Locals said polluted water and the changeable weather caused diseases. Many households in Soc Trang, Bac Lieu and Ca Mau provinces have had to stop farming because of repeated losses. The sharp price decrease and difficulties in export also caused farmers and businesses to suffer. In such conditions, some businesses have decided to apply super-intensive farming technology under which shrimp is bred in glass houses. The model has brought encouraging results with risks minimized and epidemics controlled. Since shrimp can grow quickly, farmers can shorten the farming time and have 3-4 crops a year. Breeding shrimp in glass houses not only improves productivity, but also helps minimize pollution. Vietnam-Australia JSC, a foreign-invested enterprise with a branch in Bac Lieu province, is the pioneer in applying the farming model. The company has spent VND180 billion to breed shrimp on an area of 50 hectares. The output is 40-80 tons per hectares per crop, about 300 tons per hectare per annum. It is estimated that the output is 10-15 times higher than farming the traditional way. A similar model is being applied by Hai Nguyen Company on an area of 60 hectares. 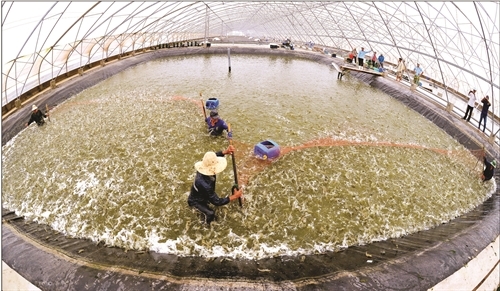 With the modern closed investment model, white-leg shrimp can be farmed in high density 200-250 shrimp per square meter. The company can harvest 900-1,000 tons of shrimp each year, making a profit of VND100 billion. According to Dang Quoc Tuan from Vietnam-Australia joint-stock company, there are many different shrimp hatchery models being applied in Vietnam. With the extensive farming model, there are 3-6 shrimp per square meter, but with the semi-intensive farming model, the density could be 70-100 shrimp per square meter. As for super-intensive farming, there are 300-500 shrimp per square meter. In super-intensive farming, the company uses Israeli membrane technology, German water purification technology and biotechnology. The initial investment rate is relatively high, about VND7 billion per hectare, or 10 times higher than other models.